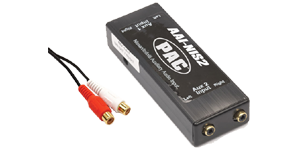 Check out our our Auxiliary (AUX) stereo input interfaces for aftermarket and factory radios! Adding an additional audio source such as an iPod, DVD player, video game into your vehicle has never been easier thanks to our wide selection of plug and play harnesses. Our interfaces feature either a single or dual stereo RCA input.